I read the author's first book, Lonely: A Memoir, years ago. I found it gripping, and I wanted to see how it all turned out for her.And in this, the sequel-of-sorts, she writes of how she managed to tame the beast and find herself a sense of belonging and connection. In that sense, this book did exactly what I wanted it to: reassured me that White's life got back on track. (Full disclosure: she's an introverted environmentalist from Toronto who loves dogs. Yes, I identified with her. )However, where it lost me was my sense that White didn't truly understand how privileged her position was. If you are a childless, able-bodied person in the middle class living in a big city with a good transit system, guess what? You too can find and join local communities. Well, that's swell--and I don't mean to minimize her accomplishment. Having struggled with loneliness myself, I know how it can eat away at you and make any social interaction feel impossible. But her situation was largely situational and personal, not structural. She writes in her concluding chapter that this is something anyone can and should do, and while she caveats this a few pages later by (finally) realizing how lucky her access to good transit is, and how it enabled her entire effort, she does not seem to understand that everything about her--every single thing, except that she's gay--was a benefit to her.She's white.She's well educated.She's able-bodied.She's not disfigured.She has no mental impairments.She is not an immigrant or refugee; she understands the major language where she lives.While she's not wealthy, she has enough money to get out and pay for yoga and meditation classes.She has no family responsibilities.She does have a loving mother, and good friends.If she saw an advertisement for a protest, a club, a class, a lecture, a volunteer activity, whatever, that she wanted to go to, she could just ... go. She didn't have to arrange for babysitting. She didn't have to call in favours from friends or family to watch the kids. She didn't have to look to see if the place was wheelchair-accessible, or presented other obstacles to those with different abilities. She could afford the transit fare. She didn't have to deal with racial prejudice, or worry if she would be rejected because she looked different--missing limbs, facial deformities. She didn't have to worry about understanding and following along with what was said. And yes, she is gay, and that can lead to rejection, but it's not something people know about you from just looking at you, unlike skin colour, accent, language, impairment, age, etc. So if you too are very privileged, and wondering how to deal with loneliness or build a bigger sense of connection and belonging in your life, you will find much of value here. If you aren't, expect to be at least somewhat frustrated. I don't want to overstate this. It was a well-written engaging book, and I was rooting for her and happy to see her success. But this is not a solution to loneliness for a great many people. Look, what if the art class that is perfect for you is offered at a location without a ramp, and the subway stops between your house and that studio don't have elevators, and you're in a wheelchair? What if you're a single parent and there's a fantastic weekly book club you'd love to join, but it's always held on a day of the week you can't get child care? What if you would love to show up at the library for monthly lectures on the history of coin collecting, but you just moved here from Zimbabwe and not only the lectures but all of the materials are only offered in English? What if you desperately need and want a local community but you're working three minimum-wage jobs in 75 hours/week to pay the rent? Whether or not you feel all such cases should be accommodated, there are larger barriers to face in this world than "lacks unlimited wealth" and "is gay." I read an articlerecently (the article that inspired me to see if this book, which I knew she was writing, had been published yet) about the physical and mental effects of chronic loneliness, and it was fairly harrowing. Lonely people get sick earlier and more often, and they're more likely to die of the illnesses they have. It can actually kill you. But worse than that was this: "Who are the lonely? They’re the outsiders: not just the elderly, but also the poor, the bullied, the different. Surveys confirm that people who feel discriminated against are more likely to feel lonely than those who don’t, even when they don’t fall into the categories above. Women are lonelier than men (though unmarried men are lonelier than unmarried women). African Americans are lonelier than whites (though single African American women are less lonely than Hispanic and white women). The less educated are lonelier than the better educated. The unemployed and the retired are lonelier than the employed. "How horrifying and awful is this? How much more of a burden is loneliness, both mentally and physically, to those who must contend against prejudice and discrimination? And how much use are they likely to find in Emily White's advice? Quite possibly, not much. When I saw that Emily White had published a second book I was pysched, and even moreso when I saw the topic. I immediately put it on hold at the library (love that public resource!!) and read it in just a couple days.I enjoyed the book, though not nearly as much as Lonely. I think my main qualm is that in my view, it lacked a certain amount of actual, concrete advice. To be fair, it's a memoir, and not an actual self-help/advice book, but that is kind of what I was hoping it would be. Setting aside that expectation, as with Lonely, there were parts of the book where I found myself thinking, "I could have written this, I feel exactly the same way!" and then feeling relieved that I'm not the only one who has felt this way. It takes a lot of guts to write so honestly and vulnerably, and I appreciate that White felt brave enough to share her experiences so openly with the world. She also has a knack for presenting research in an accessible way. I would have liked to read more about her communications and further discussion with study authors, if there were others that didn't make the cut. All in all I'm glad I read it, but it left me wanting something more. It felt like the ending came too abruptly - when I turned to that first page of the conclusion chapter, I was kind of startled. It didn't feel like the project had come to a full close. I didn't have a really firm sense of what activities she has continued to participate in, and what her next steps might be. (Though I guess that's life - we can't expect everything to wrap up neatly and conclusively, even if it would make for a powerful story). At any rate, I will certainly read White's next book. In a funny way, I feel I've found a kindred spirit in her. Count Me In is a wise book for all who suffer a 21st-century fractured existence. Emily White, the child of both divorce and a shockingly bulldozed home, knows who we are. White has the passion and heart to show the numb, the disconnected, and the hungry yearning to leap from loneliness new paths to belonging. As we follow her trials and errors from Pig Save to Belief-O-Matic, even diehard isolates will give up and join this ex-lawyer in her treasure hunt for community—and learn a little something about those “good great places” we call our spiritual homes. Insights: Looking for belonging is not the same as looking for friendship. Think about : When you felt like you belonged? What is important to you? I loved the first part of the book, but the second half lost my interest. How do you connect in an increasingly disconnected world? This book details Emily White's various attempts to find a sense of connection and belonging.White has an easy narrative style -- her list of attempts are a series of episodes, many ending with her feeling like something was still missing.Some episodes were interesting -- I enjoyed the chapters about the pig activists and the Pilates class. Unfortunately, while I sympathize with the inability to find the right "fit" with a group, the narration sometimes came off as repetitive, whiny and indulgent. I had to agree with White's friend Laura who, after one of the episodes, asked "with a hint of sarcasm that wasn't quite like her" if White felt "part of something." You could almost hear the "yet" at the end. Another friend early on called White out on not connecting with her neighbours because they weren't rich enough, & I realized that's part of what bothered me about White's writing. Her tone is one of privilege, & her quest comes off as self-centred. In the incident with Laura earlier, rather than express concern over why Laura had been uncharacteristically sarcastic, White instead takes the question at face value and uses it as a springboard to think about her own feelings. White goes from one cause to another, & while she professes to sympathize with animals and nature in general, her observations are more about how the group leader treated her and how overly friendly the group members are. She tries to be self-effacing but doesn't quite have the humour to pull it off. To her credit, she does admit her shortcomings throughout and learn from her experiences near the end. And once she does learn, the writing becomes less episodic and more insightful. An experience with her dog near the end was by far the strongest part of this book - it was heartfelt, beautifully written, & led to possibly the most important insight in her quest for belonging.+Thanks to Random House Canada for an ARC of this book in exchange for an honest review. I received a copy of Emily's White's "Count Me In: How I Stepped Off the Sidelines, Created Connection, and Built a Fuller, Richer, More Lived-In Life", compliments of Goodreads Firstreads Giveaway and appreciated the opportunity.I will start by stating that I did not like the book, but stuck with it to the end in hopes that I might gain something. I was left disappointed. Whereby the premise of the book surrounds a topic that I am interested in, it did not make the grade for me. It is clear that the author has done her own research on the topic of connection, reviewing journal articles, studies and books. It is her lived experience, and she is offering advice based on same. I found there to be too much "woe is me" within the story, rejection was a major underlying theme and it oozed whining. I don't respond well to people when they whine and it left me bored and feeling indifferent. Where I could relate to her journey to seek deeper connection to this world, I could not relate to her. Alas, I am not the readership this book is seeking. I loved this book. I had no idea at all that anyone other than me cared about the exact subject matter of this book. Others have commented that the author meanders her way through the process of connecting to a wider community but I found this helpful to realize that this was something that could be tinkered with along the way. I intend to pull a group of people together to talk about this book within the context of our own community. I really enjoyed the addition of scholarly thought on the topic and only wished there was more indepth analysis of connection in the book. In case anyone is wondering, this is a book written by someone who already had good friendships but wanted to be more connected within the social fabric of her community. I think it's a really important subject and I really enjoyed this book. This self-help/memoir is the author's experiences trying to fit in after she breaks up with her husband and moves back to her home town of Toronto. I hoped the book would be more helpful or inspirational to myself but I did not really connect with the author's own experiences. There were references to some interesting research done on how people achieve a sense of belonging. She also talked about how people are searching for connection today because so much of their lives are spent connecting in non-personal ways because of work and technology. Her chapter on volunteering was rather disappointing because her experiences actually made it appear that a lot of volunteer work won't give you what you might be looking for. I have to admit that I skimmed through some chapters because I felt that this book didn't really address what I wanted it to address, but I did like her writing style. This book really struck a chord with me. Author Emily White combines the story of her personal quest for more connection with academic research in the area of belonging. This results in a very readable, and actionable, set of suggestions for people seeking more connection with the world. She is honest and funny and sometimes wistful as she describes her attempts to connect, some successful and some not-so-much. From a local animal rights group, through international organizations, to yoga and Pilates studios, she thinks carefully about what she expected, what happened, and why. I will be recommending this widely. This is a helpful resource for anyone looking to identify how to go about joining and creating connections when you may not know how to do so, or may be scared to do so. It helped me realize a number of things about myself and my search for meaningful relationships and for a more fulfilled life. I specifically enjoyed the part relating to choosing things that are important to YOU, and not seeking belonging in places other people suggest or want you to join. You will never find what you are looking for, if you don't value the activity on some level. 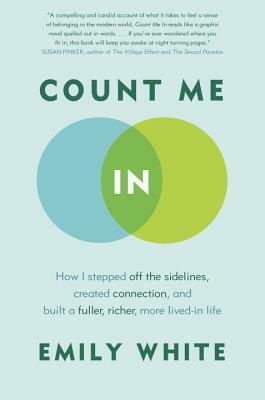 'Count Me In" by Emily White offers both realistic advice and the author’s personal experience in finding the sense of belonging or connection in life.I found it helpful to read the conclusion chapter first and it really tied everything together nicely. She points out “I think we all need at least one group that we can easily access in times of need.” As well, I found this comment relevant: “There’s no right or wrong way to ground a connection project.”Follow Emily White’s journey and take what works for you.Thank you GoodReads for the book..
Really cool take on what it means to be a citizen and roving community member in various places. Liked the personal stories a lot - felt connected to the author. Could have used some editing as I felt some parts were repetitive but overall, an interesting read. I think that White is raising a lot of questions that we should be thinking about. Belonging in this digital society is not easy and she has an interesting perspective. Very relevant book. Not as good as her first book "Lonely." Some good thoughts and experiments, but she fell short of any satisfying conclusions. Inspired me to take action, and rethink my own connections outside my family. Widening my circle. An interesting read, with a very personal approach and perspective. I did find it a bit lengthy in the middle chapters. Emily White - I used to practice environmental law, and am still passionate about protecting animals and wild spaces. My work as a lawyer informs my work as a writer. I love to research a question endlessly. With Lonely, I spent years reading everything I could about long-term loneliness. With Count Me In, I read everything I could about connection and belonging. Count Me In is a "bigger" book than Lonely. That's because I touch on so many subjects -- such as faith, neighborhood, home, and volunteering -- that feed into connection and belonging. Writing the book was an adventure, and an awful lot of fun. I'm looking forward to feedback.